Introducing the revolutionary Tillie Products Tissue Box Holder. The simple, clean design is so easy to install, it keeps your tissue box in place and where you need it. The Tillie Products Tissue Box Holder will keep your box of tissues within easy reach when you need one. Designed to stay on the “hump” that exists behind the middle console of many vehicles, the durable plastic legs are easily adjustable to fit most "humps". Fits virtually all rear wheel drive and many front wheel drive vehicles. See Application Diagram below! 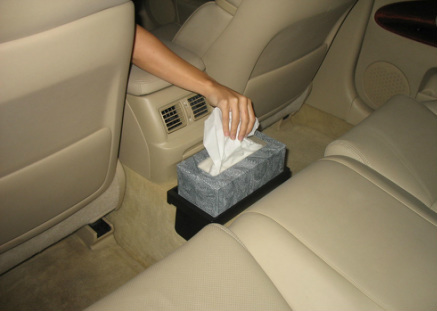 Have you ever been driving down the road, needed a tissue and couldn't find the tissue box to get one? Is your tissue box always crushed and your tissues always dirty on the floor? The Tillie Products Tissue Box Holder was designed to prevent these things from happening. By holding your tissue box in a single, easily reachable location, you'll never have to search for that tissue box again! With the adjustable legs, the Tillie Tissue Box Holder can straddle "humps" anywhere from 5" to 11" wide. The industrial strength plastic allows it to grip the floor and prevents the tissue box from becoming dislodged while driving. However with the easy adjustable legs, the Tillie Tissue Box Holder is a breeze to install and remove when needed!